This tour is full board! Transfer to Dajti Mountain (1613 m) via the longest cable car in the Balkans. We will walk through the National Park, a forest of pine trees and 200 years old oaks. In the afternoon we will visit Tirana’s highlights: Scanderbeg Square, the Clock Tower, Et’hem Bey Mosque, and more. Drive to Koman Lake and embark on a fascinating boat trip through the high peaks and gorges of the Drini River. Often compared to the Scandinavian fjords, it is considered to be “one of the greatest boat trips”. Guided walking in the village of Kukaj in the Valbona Valley will follow. Walk for about 8 hours up the Albanian Alps, otherwise known as the "Accursed Mountains", to reach the glacial lakes of Jezerca Mountain, the second highest peak of Albania. After you reach the glacial lakes you will camp for the night near the lakes. Walk the 7 hours back from Jezerca to Valbona Valley. Drive to Kosovo where we will visit the old city of Gjakova, along with its Old Baazar and Hadumi Mosque (16th Century). There we meet with local craftsmen and visit their shops. Visit the Monastery of Decan (UNESCO heritage) as well as the Serbian Patriarchate of Peja, which is on the UNESCO List. 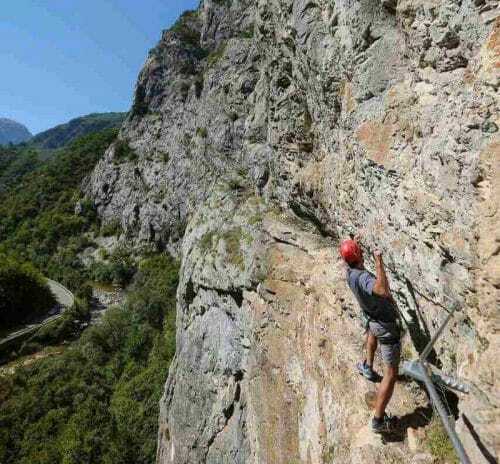 Today we will explore Via Ferrata (The Iron Road) in Peja. 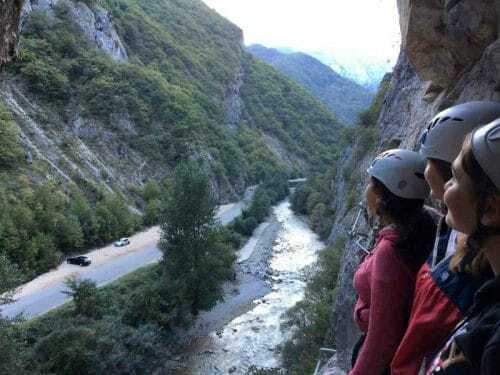 We will climb for about 100 meters through Rugova Canyon and take the zip line across the Rugova River. There we will discover the ancient caves that have been used over the years by monks, villagers and solders. Visit the old town of Prizren, Sinan Pasha Mosque and the Albanian League of Prizren. 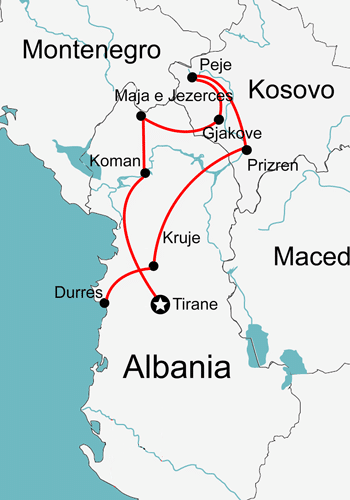 Next we travel to Kruje, Albania where we will visit the Ethnographic Museum, the Old Bazaar and the Museum of Scanderbeg. In the morning we will take a walk (1.5 hours) up to the rocky mountain of Kruje and visit Sari Salltik, a Bektashi shrine. There we will learn more about the history of the saint and visit the underground cave (20 m deep). In Durres we visit the Roman Amphitheatre built in 2nd Century AD. The city was an important segment of Via Egnatia, which connected Rome to Constantinople. Next we drive to Airport where our tour will end.